Visit La Casona, a former president's house, for a cultural activity where you'll learn about sugarcane, medicinal plants, coffee, homemade tortillas and a delicious dinner. Settle into your amazing rooms surrounded by nature and get to know your new friends as you enjoy your first delicious dinner at the eco-lodge. Enjoy your first amazing breakfast at the eco-lodge where fresh coffee, organic vegetables and homemade breads await. 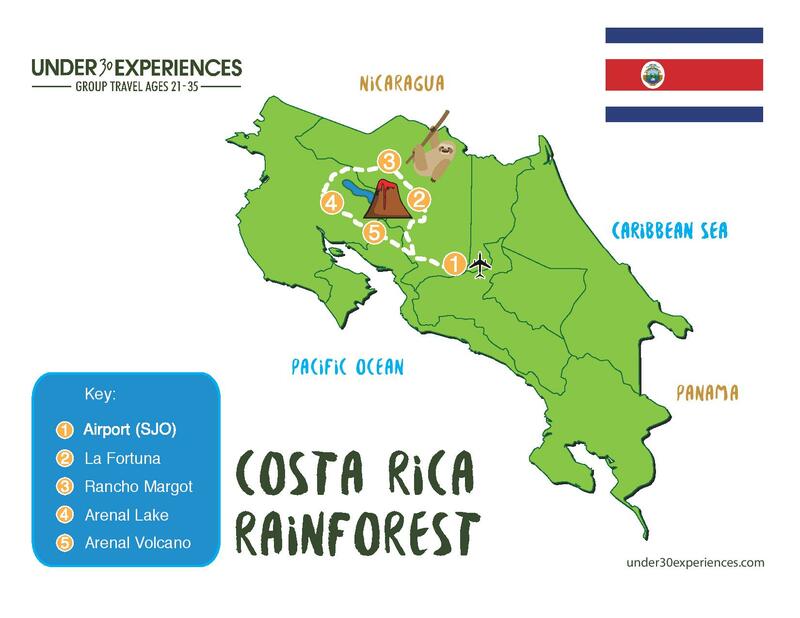 After breakfast you can hike around the Ranch or fly through the tree tops at one of the World’s best Zip-Lining tours in Costa Rica (zip-lining is optional and not included). After a nice morning walking around the property, enjoy a tasty lunch at the eco-lodge made with the vegetables grown on the farm. Spend your last afternoon soaking up the local hot springs, warmed naturally at Termalitas del Volcan and let your muscles relax after a few days filled with incredible adventures (optional activity). Another delightful breakfast at the eco-lodge. Get the feel for the true Costa Rican morning flavors with a nice coffee and a plate of tropical fruits. Spend the morning hiking various trails on the property or choose from the following optional adventures: white water rafting, kayaking Arenal Lake or enjoy a relaxing yet adventurous horseback riding tour around the lush farmlands. Optional night out in La Fortuna to finish your amazing trip on a high note, full of latin music and cocktails (transportation not included). One more amazing, yet quick breakfast at the eco-lodge before you head back the same road you came from but being a totally new person. Don’t forget your motion sickness medication if needed. Be sure your flight back home departs after 1:30 pm.